Welcome to the Bradford Railway circle website. Bradford Railway Circle Meetings commence at 7.30pm and are approx. 2 hours duration. The next Transport themed meeting will be held at Sedbergh Community Centre. On Wednesday 24th April. When we welcome Andy Barclay, who will be presenting "The Slides of Peter Fox"
Bradford Railway Circle was founded in 1945 after a Bradford gentleman put an advert in the Telegraph and Argus and as of 2017 we have approximately 100 members. In 2015 we celebrated 70 years with a dinner on the KWVR (see Gallery). The 2016 diary added to the diary page. A pdf copy can be downloaded from the downloads page. 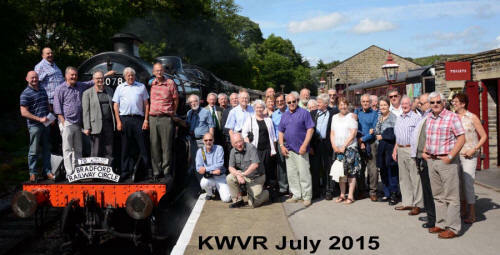 To celebrate our 70 years of existence the Circle held a Members' Sunday Lunch trip on the KWVR on 12th July 2015.